The portable analytical instruments market is projected to reach USD 9.55 Billion by 2020 from USD 8.10 Billion in 2015, at a CAGR of 3.3%. Portable analytical instruments are lightweight handheld instruments with simple infrastructure and deliver instant results, in any location and under any weather condition. The major drivers for the market include the growing food and environmental concerns; benefits of portable analytical instruments such as low cost and easy to operate; and increasing healthcare expenditure. In this report, the global portable analytical instruments market is segmented based on product, technology, end user, and region. By product, the market includes TOC analyzers, dissolved carbon dioxide & oxygen meters, titrators, refractometers, pH meters, spectrometers, gas analyzers, conductivity & resistivity meters, colorimeters, thermal analyzers, and others (thermometers and balances). Based on technology, the market is segmented into spectroscopic analysis, elemental analysis, and others (thermal analysis and electrochemical analysis). Spectroscopic analysis is further segmented into X-ray fluorescence (XRF), near-infrared spectroscopy (NIR), Raman spectroscopy, Fourier transform infrared spectroscopy (FTIR), Laser-induced breakdown spectroscopy (LIBS), and others (ion mobility spectroscopy and spectral imaging). The end users for this market are food and beverage industry, pharmaceutical and biotechnology companies, environmental testing industry, and academic and government institutions. Based on region, the market is segmented into North America, Europe, Asia-Pacific, and the Rest of the World (RoW). The North American market is further segmented into the U.S. and Canada. A combination of bottom-up and top-down approaches was used to calculate the market sizes and growth rates of the global portable analytical instruments market and its subsegments. All percentage shares, splits, and breakdowns were determined using secondary sources and verified through primary sources. All possible parameters that affect the markets covered in this research study have been accounted for, viewed in extensive detail, verified through primary research, and analyzed to get the final quantitative and qualitative data. Primary interviews with key opinion leaders were also used to determine the percentage shares of each subsegment and the relative differences in growth rates. The report provides qualitative insights about growth rates, and market drivers for all subsegments. It maps market sizes and growth rates for each subsegment and identifies segments poised for rapid growth in each geographic segment. The report includes company profiles of major market players in the global portable analytical instruments market such as Thermo Fisher Scientific, Inc. (U.S.), B&W Tek (U.S.), Danaher Corporation (U.S.), Bruker Corporation (U.S.), and Shimadzu Corporation (Japan). Other key players in this market are Agilent Technologies (U.S.), Teledyne Technologies, Inc. (U.S.), Spectris plc (U.K.), Jasco Inc. (U.S.), and HORIBA Ltd. (Japan). The portable analytical instruments market is expected to reach USD 9.55 Billion by 2020 from USD 8.10 Billion in 2015, growing at a CAGR of 3.3% between 2015 and 2020. Growing food and environmental concerns, availability of low-cost and easy-to-operate portable analytical instruments, and increasing healthcare expenditure are key factors expected to drive the growth of the market. Strategic expansions of key market players in APAC and industry initiatives towards development of novel products will provide opportunities for market growth. This report segments the global portable analytical instruments market by product, technology, and end user. 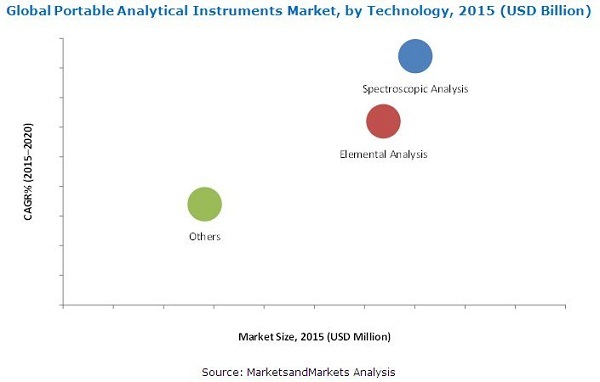 The global market product segments are TOC analyzers, dissolved carbon dioxide & oxygen meters, titrators, refractometers, pH meters, spectrometers, gas analyzers, conductivity & resistivity meters, colorimeters, thermal analyzers, and others (thermometers and balances). In 2015, the pH meters segment is expected to account for the largest share of the global market. Based on technology, the market is segmented into spectroscopic analysis, elemental analysis, and others (thermal analysis and electrochemical analysis). Spectroscopic analysis is further segmented into X-ray fluorescence (XRF), near-infrared spectroscopy (NIR), Raman spectroscopy, Fourier transform infrared spectroscopy (FTIR), laser-induced breakdown spectroscopy (LIBS), and others (ion mobility spectroscopy and spectral imaging). In 2015, the spectroscopic analysis segment is expected to account for the largest share of the global portable analytical instruments market as this technique is commonly employed for various applications that require high precision and accuracy, such as food and beverage testing, drug testing, environmental testing, and academic and research. On the basis of end users, the global portable analytical instruments market report is segmented into food and beverage industry, pharmaceutical and biotechnology companies, environmental testing industry, and academic and government institutions. With the increasing stringent regulations regarding food safety, the food and beverage industry is the largest end user for market. The geographic segments included in this report are North America, Europe, Asia-Pacific, and the Rest of the World (RoW). North America is further segmented into the U.S. and Canada. In 2015, North America is expected to command the largest share of the global portable analytical instruments market due to the presence of major key players in this region, thereby, increasing its market share. With the rising food, environment, and drug safety concerns in Asia-Pacific, the demand for portable analytical instruments in this region is expected to grow, which in turn will compel the key players to expand their geographical presence in this region. Therefore, the strategy of expansions by the key players in this region is fueling the growth of this market. Major players in the global portable analytical instruments market are Thermo Fisher Scientific, Inc. (U.S.), B&W Tek (U.S.), Danaher Corporation (U.S.), Bruker Corporation (U.S.), and Shimadzu Corporation (Japan). Other players in this market are Agilent Technologies (U.S.), Teledyne Technologies, Inc. (U.S.), Spectris plc (U.K.), Jasco Inc. (U.S.), and HORIBA Ltd. (Japan). 11.2 Thermo Fisher Scientific, Inc.
*Details on Financials, Product & Services, Strategy, & Developments Might Not Be Captured in Case of Unlisted Companies. Figure 76 Company Snapshot: Thermo Fisher Scientific, Inc. Figure 80 Company Snapshot: Agilent Technologies, Inc. Figure 81 Company Snapshot: Horiba, Ltd. Figure 83 Company Snapshot: Teledyne Technologies, Inc.